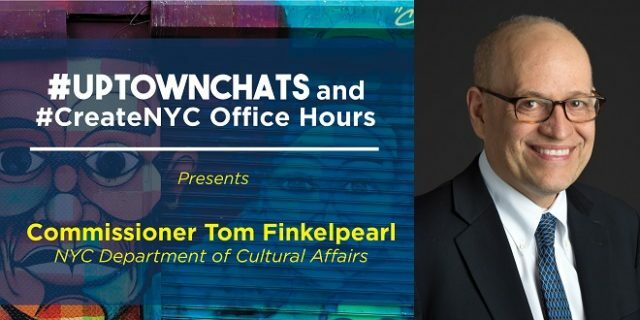 Join us for a special #UptownChats & #CreateNYC Office Hours with Commissioner Tom Finkelpearl of the NYC Department of Cultural Affairs on Tuesday, November 27th from 6:00 – 8:00 pm at the Harlem School of the Arts (645 St, Nicholas Avenue, between 141st & 145th Streets). Commissioner Finkelpearl will engage us in an exciting discussion about major culture initiatives, including the role of culture in shaping a more equitable city, as well as answer questions from the community. Harlem School of the Arts’ public entrance on St. Nicholas Avenue is accessible by ramp. The conversation space is accessible by wheelchair elevator. To request accommodations, please RSVP at: https://tinyurl.com/uptownchatsrsvp or contact Sara Cobb, DCLA Disability Service Facilitator, at disabilityfacilitator@culture.nyc.gov or 212-513-9376 by November 15th. Special thanks to our sponsor ConEdison for their support! Have questions about the event or how to become a sponsor? Want to suggest a speaker? Please reach out to rachel@weact.org.